Product categories of Various Pole Anchors, we are specialized manufacturers from China, Pole Anchors, Galvanized Pole Anchors suppliers/factory, wholesale high-quality products of Stainless Steel Pole Anchors R & D and manufacturing, we have the perfect after-sales service and technical support. Look forward to your cooperation! Anchor poles are called post holders or steel holder in some countries. Commonly, they are using Q235 as the raw material, the thickness plate is usually 2 to 5 mm. Production process is cutting, bending , welding, acid- pickling, among these, aicid-pickling is very important treatment, it is affect the service life of the Pole Anchors. Generally ,they can be used 8 to 10 years . Many type are included: common type, H type, TT type, U type, screw type, adjustable type,and others. Our factory have been exporting these products for many years and have rich experience in making these , furthermore, we have gain CE certification on the steel holder.Good quality and superior service offer you enough excuses to placing your order! 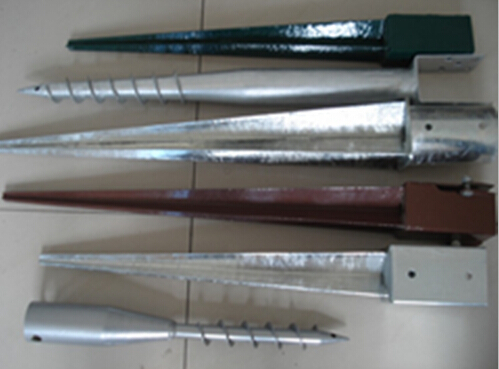 Of course,in addition to them,we also supply the steel ground drill(Steel Groud Drill) and Galvanized Steel Clamp.